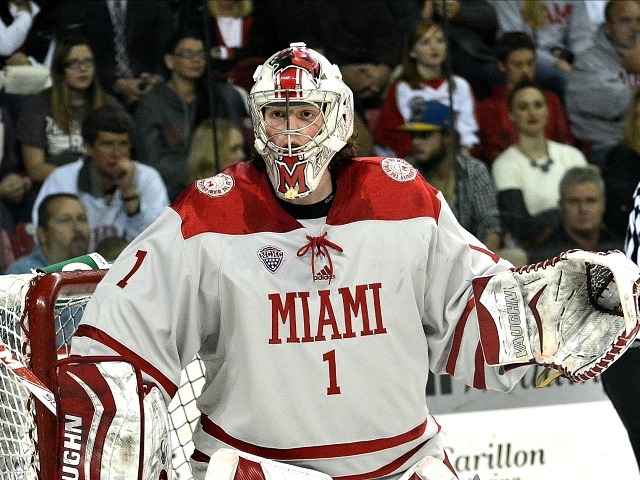 The shorthanded goal has been a Miami nemesis all season, and on Saturday a pair of them contributed to the end of the RedHawks’ season. Minnesota-Duluth beat Miami, 3-1 in Game 2 of a best-of-3 NCHC Tournament quarterfinal series, completing a sweep of the RedHawks. 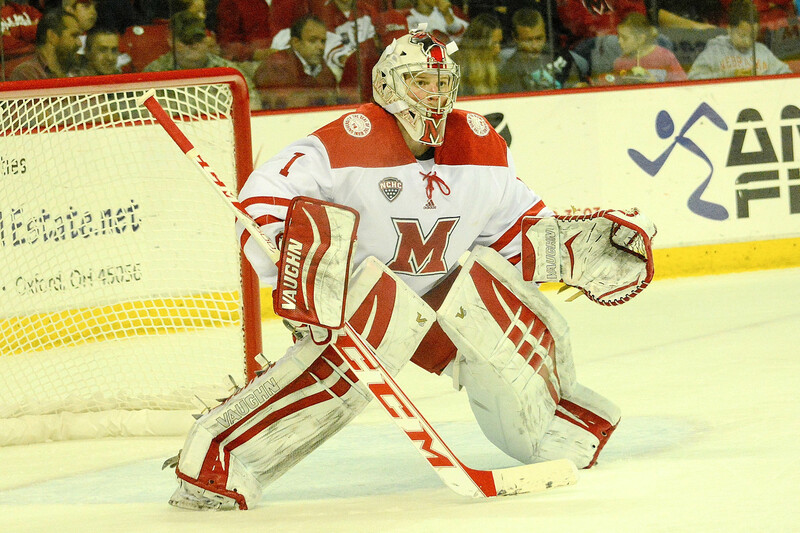 Miami (15-18-3) finished the season with four consecutive losses, all on UMD’s home ice. It was the first three-game playoff series loss by the RedHawks since 2009 vs. Northern Michigan, and March 12 ties the earliest ending to a Miami season since 2005. The Bulldogs’ Kyle Osterberg opened the scoring with an unassisted shorty just 96 seconds into the game. He stripped Miami senior defenseman Matthew Caito at the blue line and went in alone, beating senior goalie Jay Williams on the stick side. Minnesota-Duluth (17-14-5) made it 2-0 with 3:09 left in the first period on a power play goal by Andy Welinski, which he scored on a slap shot off a drop pass from Jared Thomas. An outlet pass from Karson Kuhlman found Tony Cameranesi, who juked Williams and beat him on the forehand with 7:14 left in the middle stanza. Miami senior forward Kevin Morris (photo by Cathy Lachmann). 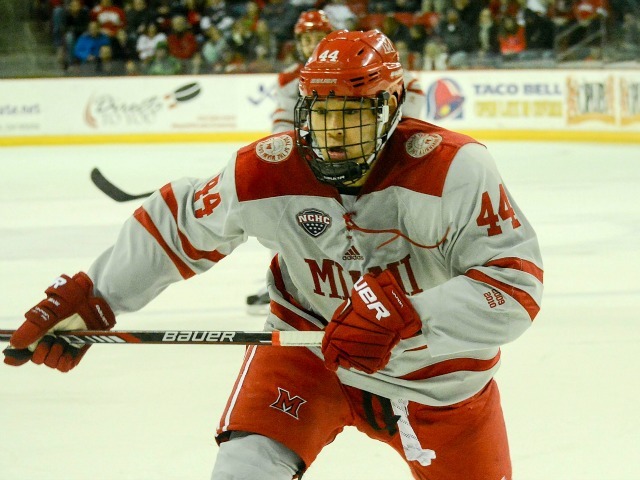 The RedHawks cut the deficit to two when freshman forward Jack Roslovic corralled a loose puck, skated in and centered one to senior forward Kevin Morris for a tap-in with 2:48 left in regulation, but Miami could pull no closer. MU actually outscored UMD 5-on-5, netting the only even-strength goal of the game, but allowed all three of its goals on special teams — one on the man advantage and two shorthanded. Miami ended the season with one SHG for and seven against. 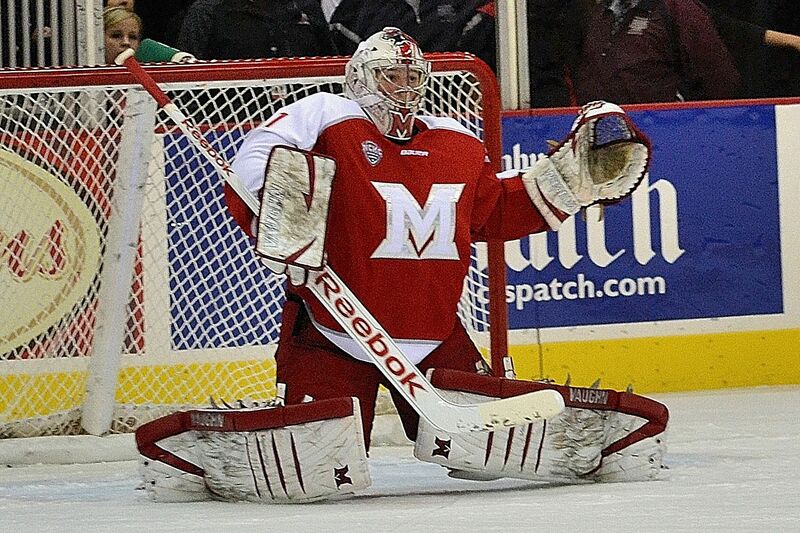 The RedHawks were 7-2 in NCHC Tournament games entering this weekend and 2-0 on the road, having swept St. Cloud State in 2014. 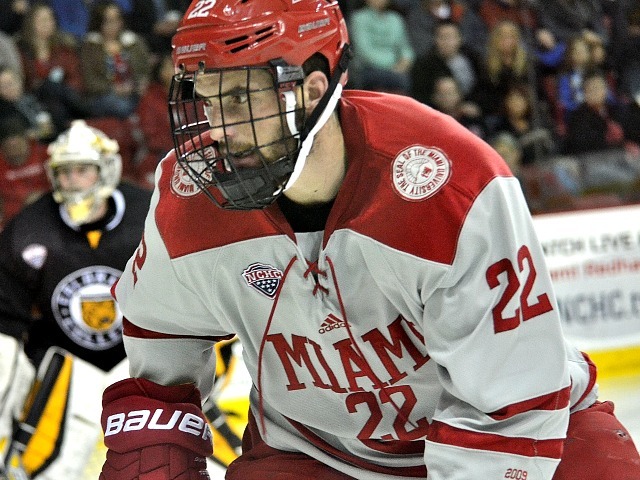 Miami loses seniors forwards Morris, Alex Gacek, Sean Kuraly, Andrew Schmit and Michael Mooney, defensemen Matthew Caito, Taylor Richart and Chris Joyaux and goalies Williams and Ryan McKay. The team said it expects 13 freshman to come to Oxford this fall. Coming back from a game down in a best-of-3 series is arduous, exponentially so on the road. But add in that Miami led twice in Game 1 – including by a pair of goals, 4-2 – before allowing three third-period tallies, and that task becomes herculean. Unfortunately for the RedHawks, that’s the position they are in after Friday’s 5-4 loss at Minnesota-Duluth in the opening game of their best-of-3 NCHC Tournament quarterfinal round road series. It’s the type of demoralizing loss that is tough to come back from at any level, in any sport. It almost would’ve been better if Miami (15-17-3) had lost this game 6-0. Now the Bulldogs (16-14-5) smell blood and want to close this thing out, because playing a third game in three days is a hindrance on many levels, especially with a clear-cut No. 1 goalie in Kasimir Kaskisuo. The RedHawks have exceled when faced with elimination in past years, but they are now 0-4-1 vs. UMD this season and need to win back-to-back games on the Bulldogs’ home ice just to advance to Minneapolis. And what are the odds that Kaskisuo, one of the top goalies in Division I, much less the conference, stops .818 of his shots faced again in a best-of-3? It’s looking grim for Miami, but the team did finally break through for four goals after being held to four in four previous games vs. UMD, so hopefully that offensive confidence carries over to the final two games of this set. – Noticing this more recently, but the defense was soft on a couple of these goals in terms of challenging opponents. Cal Decowski was left alone at the blue line for the first goal, which granted was on an outstanding tip-in, but still, this was an even-strength tally. Three others were on 2-on-2s. Louie Belpedio was aggressive on one skater at the blue line but was ultimately rendered off-balance and Miami was scored on. 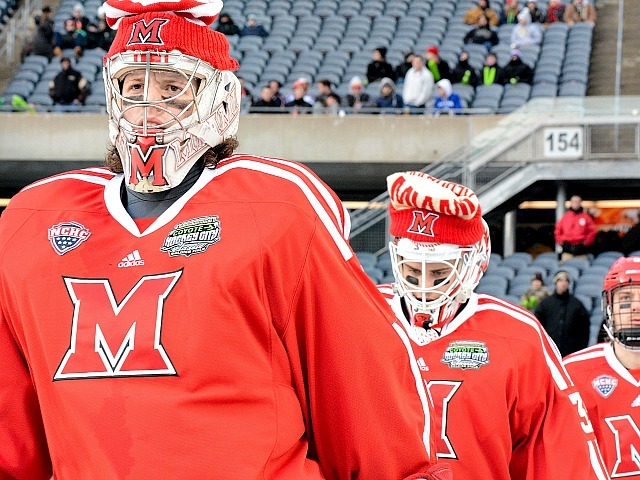 – Seems like UMD is targeting Miami senior goalie Jay Williams’ glove side. One goal he definitely would’ve wanted back (the tying marker that made it 2-2), and he was beaten that way multiple other times, albeit on point-blank chances. – Great to see senior defenseman Matthew Caito back, as Miami had clearly struggled in his absence, although it’s unclear if he’s 100 percent after missing two weeks. Still, less than 100 percent of Caito is better than most Division I blueliners. – Freshmen Zach LaValle and Ryan Siroky both scored, which they haven’t done much of this season, and hopefully doing so on this stage will set the tone for them heading into next season in a class that has already been a successful one with the initiation of Josh Melnick, Jack Roslovic, Kiefer Sherwood and Grant Hutton. – Minnesota-Duluth is giving credibility to the theory that the No. 5 seed is worse than the lowest three because the Bulldogs are still fighting for an NCAA berth. This is an impressive team that underachieved during the regular season but appears to be peaking at the most opportune time. That’s not good for Miami. Miami is almost certainly one loss away from having its season end. 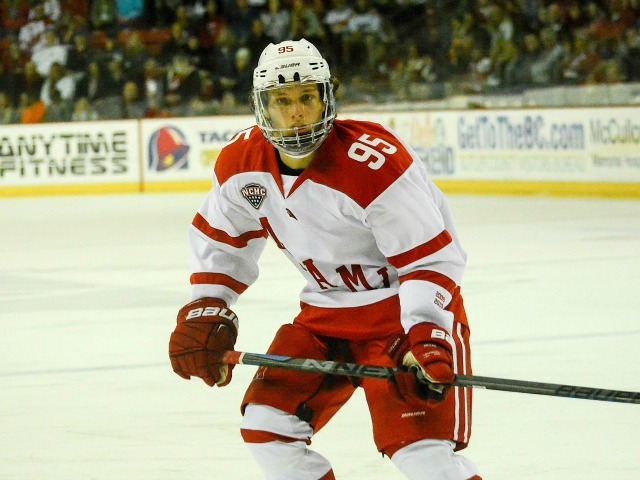 The RedHawks saw a two-goal lead vanish, as they surrendered three unanswered third-period goals in a 5-4 loss at Minnesota-Duluth on Friday in the first game of a best-of-3 series. 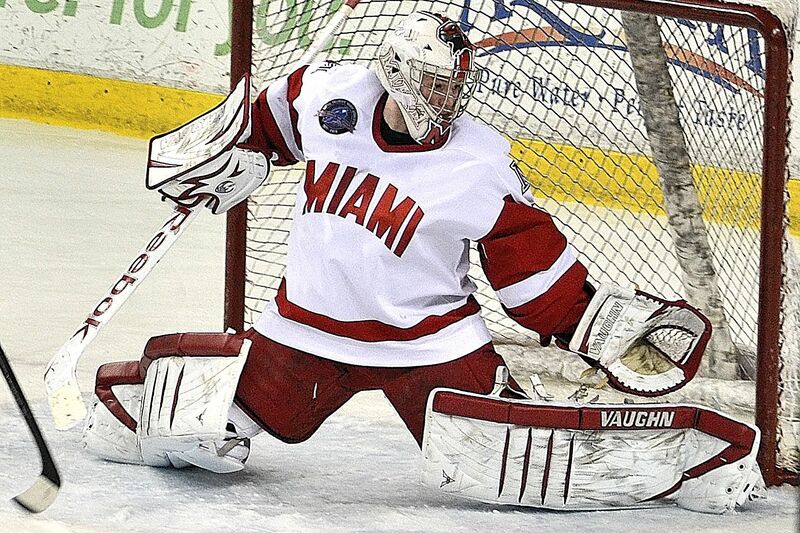 It was Miami’s third straight game in Duluth, and its third straight loss. The RedHawks finished the regular season with a road series vs. the Bulldogs and were swept. UMD (16-14-5) opened the scoring when Austyn Young tipped home a blueline wrister by Cal Decowski just 4:34 into the game. Miami (15-17-3) tied it on a goal by freshman forward Zach LaValle, who fired in a bad-angle shot with 7:43 left in the first period. The RedHawks went ahead, 2-1 when a Bulldogs defensive zone pass hit the skate of sophomore forward Conor Lemirande and slid to freshman forward Ryan Siroky, who whipped in the off-balance shot 4:11 into the middle stanza. UMD tied it again on a blueline shot by Adam Welinski on the power play with 10:01 to play in that frame. But Miami regained the lead just 18 seconds later, as senior forward Alex Gacek and junior forward Anthony Louis played give and go, with Gacek centering a pass to Louis, who skated in and backhanded one past Bulldogs goalie Kasimir Kaskisuo. The RedHawks went ahead two just three minutes later, as a blast by sophomore defenseman Louie Belpedio found twine to make it 4-2 after two periods. Unfortunately for Miami, there were still 20 minutes left. Adam Johnson cut the lead to one when he drove the net 2-on-2 and beat senior goalie Jay Williams 4:54 into that stanza. With 8:48 left in regulation, Neal Pionk tied it on a power play rip from the blue line. The game winner came from Carson Soucy, just his second marker of the season, as he was the trailer on a 2-on-2 and shot the puck in from the slot. Ten of the RedHawks’ skaters recorded a point, with Louis recording a goal and an assist for a team-best two points. 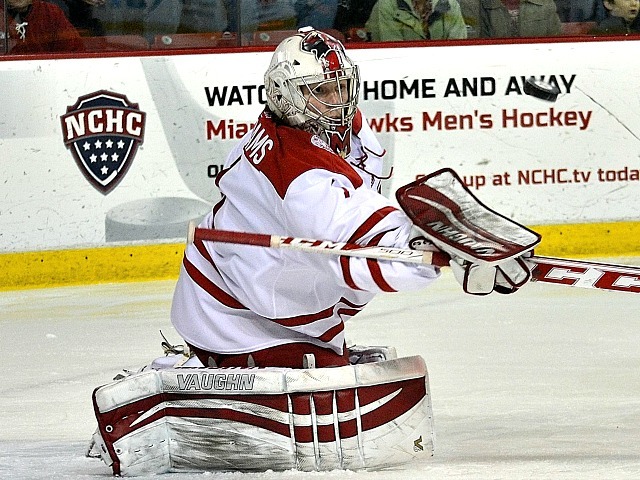 At this point, the only way Miami could earn an NCAA Tournament berth without winning the NCHC Tournament would be if it advanced to the title game and lost, thus giving the RedHawks a requisite .500 record, and everything went right for them in the PairWise rankings, which would be an extreme longshot. The RedHawks are currently tied for 23rd and would need to improve to 14th or better to have a legitimate shot at an at-large bid. Game 2 of this series is at 8:07 p.m. on Saturday, and Game 3 – if necessary – would be at 8:07 p.m. on Sunday.